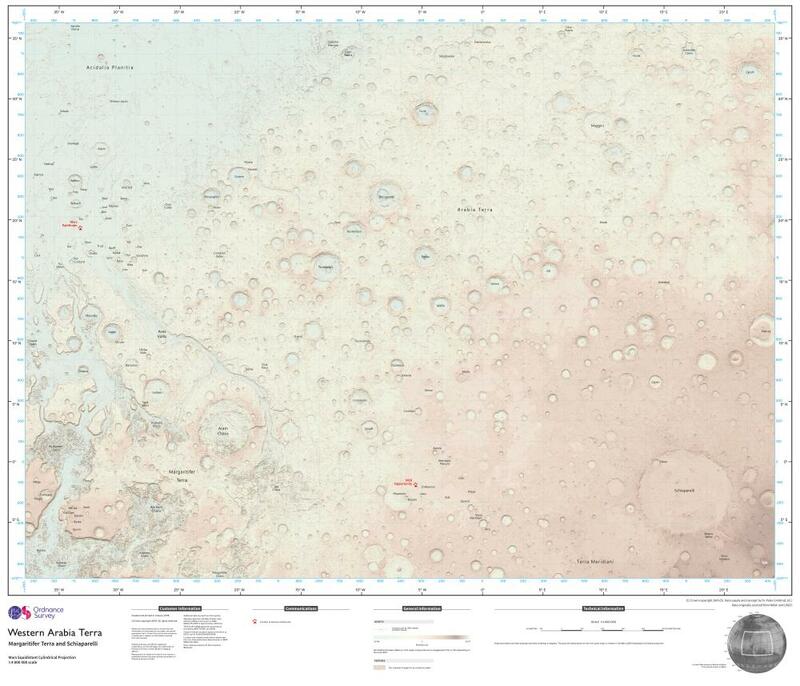 The British mapping agency Ordnance Survey has created an easy-to-read map of Mars’ surface using Nasa open data. The map – posted to Flickr on Friday – covers 3.8m sq miles or approximately 7% of the red planet’s surface. It was produced to a scale of one to 4m. The landing sites of past rovers are featured on the map, including the Mars Pathfinder in north-west Ares Vallis and the Opportunity rover, east of Margaritifer Terra. Cartographic designer Chris Wesson “designed the map over a couple of months”, according to the Ordnance Survey blog. It is the first landscape the agency has mapped from another planet. Despite Mars’ nickname and its crimson surface, OS did not produce a red map. Wesson 前記 he chose a green and pink color scheme because “Earth-based maps are not always blue and green” and he wanted “to represent the data in the way OS would have had we been given Earth data to create a regular map sheet in a typical OS style”. Wesson believes this map is different than other maps of the planet because he treated the Mars data the same as “any other Earth-based geographic information or landscape”. Ordnance Survey was asked to commission the map by British scientist Dr Peter Grindrod at Birkbeck, University of London, according to the BBC. Grindrod is one of the scientists helping to plan the landing of a new rover on Mars in 2019. Asked if he thought people might be using his map while “walking on the surface of Mars” one day, Wesson was unsure.